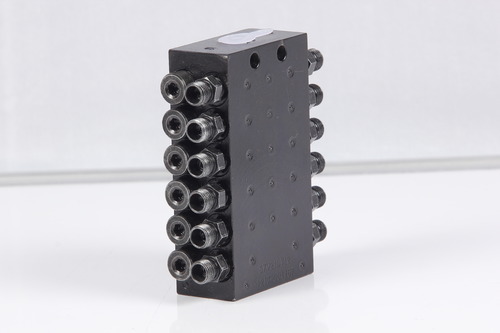 We are the leading and prominent Manufacturer, Supplier and Exporter of Progressive Distributor Mono Block. “S.V.A Rikkon Lubes Private Limited,” is a leading and well recognized name as manufacturer, supplier and exporter of Automated Lubrication system (ALS). It includes Dual Line Systems, Progressive Distributor Block & High Pressure Hydraulic Fittings, Pneumatic Pump for water supply and grease transfer & spraying, Motorized Radial Pump, Lube Timer and Oil System for Turbine & Pumps. An ISO 9001:2008 certified unit, the dedicated and client centric business approach followed by the company can be seen in the strong market base it has successfully established in the market. Operating from its base at Chennai, Tamil Nadu, India, company has with it more than a decade of industry experience in successfully understanding and supplying the specific automated lubrication system component and equipment needs as provided by the clients. Today, ‘S.V.A Rikkon Lubes Private Limited’ has successful formed business association with many reputed concerns and is meeting their demands of lubrication systems for both oil and grease. Further, it flawlessly maintains defined quality standards in lubrication equipment so as to match with their functional demands in different industry sectors. Some of the areas these are currently used include Rubber processing machinery, Plastic Injection Molding Machine, Steel plants, Glass container machinery, Wind mills, Cement plants, Mining equipment, Machine tools, Special purpose machines among others.